Moving workloads from an on-premise software-defined data center to the cloud is an extremely stressful time for CIOs. 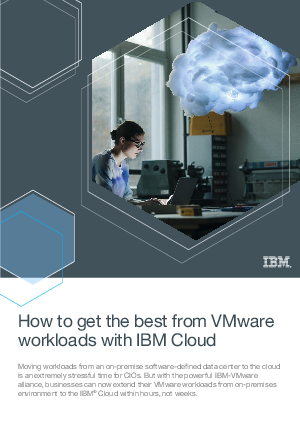 But with the powerful IBM-VMware alliance, businesses can now extend their VMware workloads from on-premises environment to the IBM Cloud within hours, not weeks. Read on to find out how companies can deploy an enterprise-class VMware environment in as little as a few hours, with on-demand bare metal and virtual servers.